Any Little River Band fans out there? This month marks my fifth anniversary at The New Paper. This is the longest I've ever stayed with one company. Yes, I spent 10 years at MediaCorp, but that was over three separate stints. 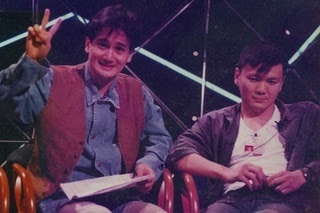 I was at SBC (Singapore Broadcasting Corporation) for six months in 1994 where I was a research writer and appeared as a movie reviewer with Gurmit Singh on Live On 5. I returned to TCS (Television Corporation Of Singapore) in 1997 for four years plus a few months where I worked on Shiver, Under One Roof and Phua Chu Kang seasons 2 and 3. I returned again in 2004 to MediaCorp Studios for another 4+ years where I worked on Daddy's Girls, Living With Lydia, Maggi & Me, Lifeline and the final season of Phua Chu Kang. So each time I joined (and rejoined) MediaCorp, I would work on a show with Gurmit Singh, which isn't really saying much since everyone at MediaCorp eventually works on a show with Gurmit Singh. But very few can say they worked on his first show, Live On 5. Also, each time I was there, the company had a different name. So the only chance I'll go back is if it changes its name again, which makes it rather unlikely there will be a fourth time. So chances are, I'll be staying at The New Paper for a while. One thing I discovered at The New Paper is how similar it is to working for Channel 5. Just as TNP is the lesser sibling to The Straits Times at SPH, Ch 5 is the lesser sibling to Ch 8 at MediaCorp Studios. Because of the sheer volume of Ch 8 productions, they set the standard for production values for Ch 5 in-house productions as well. Unfortunately, it's harder for local shows on Ch 5 to get away with Ch 8 production values as Ch 5 shows are shown alongside Hollywood productions and will always look like crap in comparison. That is also why some local shows by outside production houses look better than MediaCorp in-house productions. Anyway, I no longer concern myself with such matters after joining The New Paper in 2008. Five years later, the paper is now celebrating its 25th anniversary and has a different editor. But the biggest difference for me personally is that my only real friend at the paper, Paik Choo, left last August. We knew each other from my second stint at TCS when she was working as a "dialogue consultant" for Growing Up. She would help me get The New Paper job a decade later. She's now freelancing for InSing and others. I miss seeing her around the newsroom. Anyway, to commemorate my half decade at The New Paper, here's my first published article as a full-time staffer. 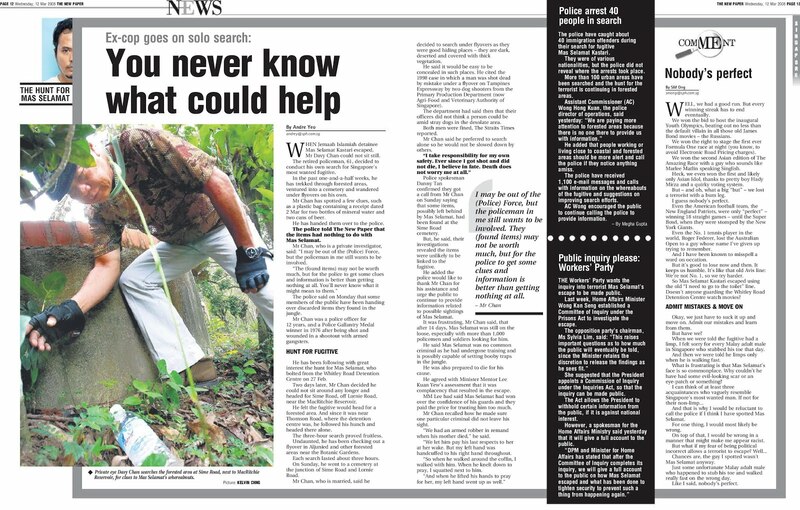 It's the little article on the right, a comment about Mas Selamat, who escaped right after I joined TNP, headlined "Nobody's perfect". After the article came out, I was stunned to read in an online forum that I was an apologist for the Government. I had no idea. It was weird to have other people attach some imagined motivation behind what you wrote to fit their conspiracy theories and being so convinced they're right. Of course, since then, I've been too busy apologising for myself to be an apologist for anyone else. So far, 17 of my columns have not been published because of political incorrectness and other reasons. One of those rejected columns is about my top five MediaCorp CEOs. You can read why Lee Cheok Yew is my all-time favourite MediaCorp CEO as a prelude to my "fool for stool" column. With dread, I look forward to more columns being rejected at The New Paper for years to come. Meanwhile, we'll go dancing in the dark, walking through the park and reminiscing.